Configure the simulation parameters (rolling horizon, data slicing) in the configuration file. Open the GAMS simulation files (project: UCM.gpr and model: UCM_h.gms) and run the model. Read and display the simulation results. This section provides a detailed description of these steps and the corresponding data entities. The whole resolution process for a dispa-SET run is defined from the processing and formatting of the raw data to the generation of aggregated result plots and statistics. A flow chart of the consecutive data entities and processing steps is provided hereunder. Convert to the right format (timestep, units, etc). Python scripts to translate the data between one format to the other. Although two versions of the database are available (mysql and csv), the public version of Dispa-SET only comes with the latter. The Dispa-SET input data is stored as csv file in directory structure. A link to the required data is then provided by the user in the configuration file. The above figure shows a partially unfolded view of the database structure. In that example, data is provided for the day-ahead net transfer capacities for all lines in the EU, for the year 2015 and with a 1h time resolution. 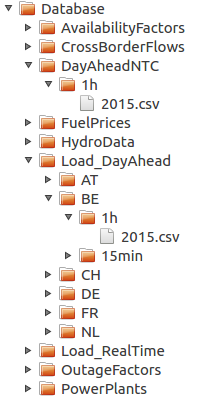 Time series are also provided for the day-ahead load forecast for Belgium in 2015 with 1h time resolution. The excel config file is read at the beginning of the pre-processing phase. It provides general inputs for the simulation as well as links to the relevant data files in the database. 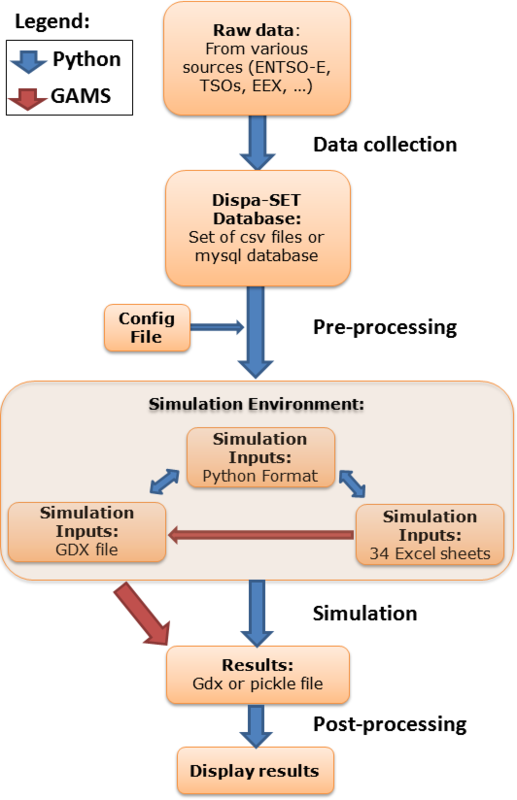 This section describes the different simulation files, templates and scripts required to run the DispaSET model. For each simulation, these files are included into a single directory corresponding to a self-sufficient simulation environment. A more comprehensive description of the files included in the simulation environment directory is provided hereunder. UCM_h.gms is the main GAMS model described in Chapter 1. A copy of this file is included in each simulation environment, allowing keeping track of the exact version of the model used for the simulation. The model must be run in GAMS and requires a proper input file (Inputs.gdx). Requires: Inputs.gdx Input file for the simulation.
. Results.xlsx Simulation results in xlsx format. UCM.gpr is the GAMS project file which should be opened before UCM_h.gms. GAMS file that reads the different template excel files and generates the Inputs.gdx file. This file should be opened in GAMS. Batch script that generates the input file from the template without requiring opening GAMS. The first time it is executed, the path of the GAMS folder must be provided. GAMS file to generate the excel Results.xlsx file from the Results.gdx generated by GAMS (in case the write_excel function was deactivated in GAMS. All the inputs of the model must be stored in the Inputs.gdx file since it is the only file read by the main GAMS model. This file is generated from the DispaSET template. Series of 42 excel files, each corresponding to a parameter of the DispaSET model (see Chapter 1). The files must be formatted according to section 2.2. Single excel file that contains all the sets used in the model in a column format. Single excel file that contains simulation metadata in the form of a Table. This metadata allows setting the rolling horizon parameter and slicing the input data to simulate a subset only. The name of the input files are “Input Dispa-SET – [Parameter name].xlsx”. These files contain the data to be read by the model, after conversion into a GDX file. In the case of the file “Input Dispa-SET – Sets.xlsx”, all the required sets are written in columns with the set name in row 2. Post-processing is implemented in the form of a series of functions to read the simulation inputs and results, to plot them, and to derive statistics. The total energy generated by each fuel, in each country. An example usage of these funciones is provided in the “Read_Results.ipynb” notebook.